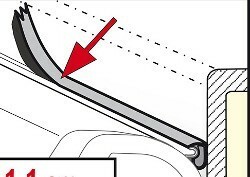 New style Privacy Room for Fiamma F45 awnings with length from length 300 to 550 and fitted heights from 230cm to 280cm on van conversions and motorhomes. Set of 3 lock barrels for Fiamma Safe Door and Safe Door Frame security locks. This is a one key system so all locks work from the same keys. Welcome to the new Agent-Fiamma website. As ever these things are working progress and can't be rushed, so over the next 12-months or so we aim to continue improving all aspects of our Agent-Fiamma website, to meet the needs of our ever growing number of customers. I do hope you enjoy! If you have purchased a caravan or motorhome for the very fist time and have only recently discovered the Fiamma brand, you might be wondering how on earth to pronounce the word correctly? We're often referred to by customers as Fiammi or Famma and some folk are even a little self-conscious about saying Fiamma when calling our office, just in case they pronounce it incorrectly. Now, we at Agentfiamma would hate for anyone to loose sleep over such trivial matters, so for those of you putting off that important phone call to Agent-Fiamma, here's an interesting link to a native Italian speaker pronouncing the word Fiamma (link will open in new window). Fiamma incidentally translated into English means flame or fire, hence the strong reference to red in the Fiamma Logo. Hey don't laugh! Just remember, one man's trivia is another man's obsession! Fiamma manufacturer a unique and often innovative range of accessories for the motorhome and caravan, which includes awnings, Carry-Bike bike carriers, Ultra-Box roof and rear mounted storage boxes, motorhome ladders, Fixing-Bar Roof Bars, security devices, water pumps, water tanks and a whole host of outdoor equipment perfect for any campsite holiday. 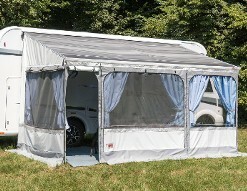 Fiamma motor caravan and camper-van accessories are extremely popular in the UK and throughout Europe. The only competition Fiamma has in the UK comes from the Thule owned Omnistor brand. However, Fiamma products are cheap compared to their rivals and the Fiamma accessory range is far more comprehensive. It is the mission of Agentfiamma to provide the highest standards in customer service and support to all our customers. We continually work hard to cultivate good working relationships with our Fiamma suppliers. Excellent supplier relations help strengthen the diligent process of procurement, which enables us to sell our Fiama products at heavily discounted prices. At Agentfiamma we invest in our people, which enables our staff to continually refine and develop the key skills and experience required, to meet the demands of our customers. Agentfiamma is operated from Camperlands in sunny South Manchester. Camperlands is a well known camping and outdoor goods retailer with over 40-years experience. Although Agent-Fiamma is purely an online business, you are more than welcome to visit us at the Camperlands showground, where you will find the entire Fiamma accessory range plus, accessories for camping, caravanning and motorhome holidays.